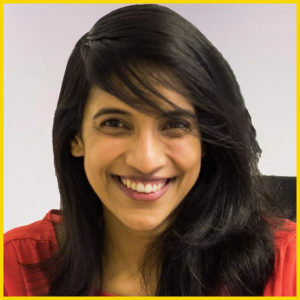 Surabhi is a freelance researcher and coach, building customer research and design thinking capabilities within non-profit, governmental, and corporate organizations. Prior to her work as an independent consultant, Surabhi was a customer researcher at Bose Corporation and innovation consultant at Peer Insight. Over the last thirteen years, Surabhi has worked across sectors with clients like Accenture, Bose, Capital One, Etsy, Girls in Tech, Kimberly-Clark Corporation, Microsoft, MillerCoors, MetLife, Spotify, The Good Samaritan Society, The Pittsburgh Foundation, United Nations Development Programme, U.S. Department of Health and Human Services, and Vanguard. In addition to her consulting work, Surabhi volunteers as an Empowerment Facilitator for single mothers pursuing a career-track college education at the Jeremiah Program in Brooklyn. Surabhi loves partnering with The Design Gym where she works at the sweet spot of creative facilitation and empowerment. Surabhi holds an MSc in Local Economic Development from the London School of Economics and a BA in Economics and Political Science from McGill University.